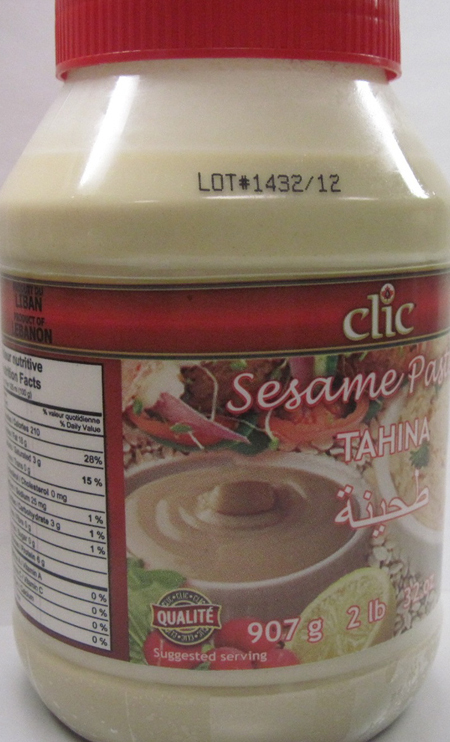 Health Hazard Alert: Certain Clic Brand Sesame Paste Tahina Recalled. Regarding the Canadian Food Inspection Agency’s (CFIA) ongoing food safety investigation, the recall update now includes the following additional Tahina product of the brand name Clic. The Canadian Food Inspection Agency (CFIA) is warning the public not to consume the Clic brand Tahina described below because it may be contaminated with Salmonella bacteria. The importer is Clic International Inc. (Laval, Quebec, Canada). The above product was imported from Lebanon. The affected product was distributed for retail in Ontario and Quebec. Ottawa, August 6, 2013 – The public warning issued on July 29, 2013 has been updated to include an additional product. The Canadian Food Inspection Agency (CFIA) is warning the public not to consume the Clic brand Tahina described below because it may be contaminated with Salmonella. The CFIA is working with the importer to remove the affected product from the marketplace. The CFIA is monitoring the effectiveness of the recall. The following product, imported from Lebanon, is affected by this alert. Ottawa, le 6 août 2013 – La portée de la mise en garde du 29 juillet 2013 a été mise à jour pour inclure un autre produit. L’Agence canadienne d’inspection des aliments (ACIA) avise la population de ne pas consommer le tahina de marque Clic décrit ci-dessous. En effet, ce produit pourrait être contaminé par la bactérie Salmonella. L’ACIA collabore avec l’importateur afin de retirer le produit visé du marché. L’ACIA surveille l’efficacité du rappel. Le produit suivant, provenant du Liban, est visé par cette mise en garde.